1. The marks obtained by 10 students in a mathematics test are 75, 90, 70, 50, 70, 50, 75, 90, 70 and 75. Find their median mark? 2. The numbers 2, 3, 4, 4, 2x + 1, 7, 7, 8 and 9 are written in an ascending order. 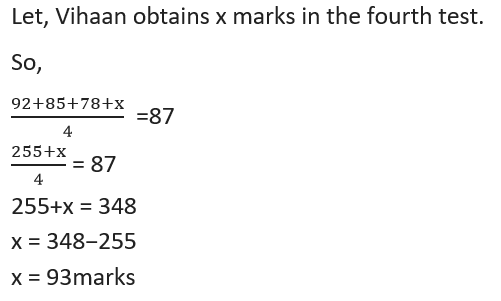 If the median is 7, then find mode of this data? 4. The mean of five observations is 15. If the mean of first three observations is 14 and that of last three is 17, then find the third observation? 5. The mean of 50 observations is 39. If one of the observations which was 23 was replaced by 43, what will be the resulting mean? 6. The traffic police recorded the speed (in km/h) of 10 motorists as 48, 52, 57, 55, 42, 39, 60, 49, 53 and 47. Later an error in recording instrument was found. If the instrument has recorded the speed 5 km/h less in each case, then find the correct average speed of the motorists? 7. When the data consists of 3, 4, 5, 4, 3, 4, 5, which statement is true? 9. Vihaan has marks of 92, 85, and 78 in three mathematics tests. In order to have an average of exactly 87 for the four math tests, what marks he should obtain? The marks obtained by 10 students in a mathematics test are 75, 90, 70, 50, 70, 50, 75, 90, 70 and 75. Find their median mark? The median is the middle value for a set of data that has been arranged in ascending or descending order of magnitude. So, median is average of 70 and 75 i.e. 72.5. The numbers 2, 3, 4, 4, 2x + 1, 7, 7, 8 and 9 are written in an ascending order. 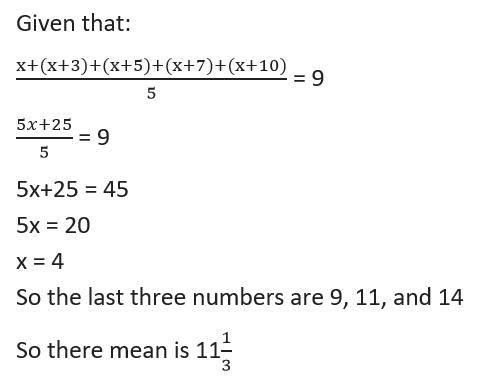 If the median is 7, then find mode of this data? The median is the middle score for a set of data that has been arranged in ascending or descending order of magnitude. The mean of five observations is 15. If the mean of first three observations is 14 and that of last three is 17, then find the third observation? The mean of 50 observations is 39. If one of the observations which was 23 was replaced by 43, what will be the resulting mean? The mean of 50 observations is 39. The traffic police recorded the speed (in km/h) of 10 motorists as 48, 52, 57, 55, 42, 39, 60, 49, 53 and 47. Later an error in recording instrument was found. If the instrument has recorded the speed 5 km/h less in each case, then find the correct average speed of the motorists? The sum increases by 50, so the new sum is 552. So the average speed of 10 vehicle is 55.2 km/h. When the data consists of 3, 4, 5, 4, 3, 4, 5, which statement is true? The mean is equal to the sum of all the values in the data set divided by the number of values in the data set. The mode in a list of numbers refers to the integers that occurs most number of times. Vihaan has marks of 92, 85, and 78 in three mathematics tests. In order to have an average of exactly 87 for the four math tests, what marks he should obtain?